Mississauga, ON, April 3, 2019 — Today, EllisDon announced that it has been named to the 2019 LinkedIn Top Companies List, which honours the 25 most sought-after companies nationwide. 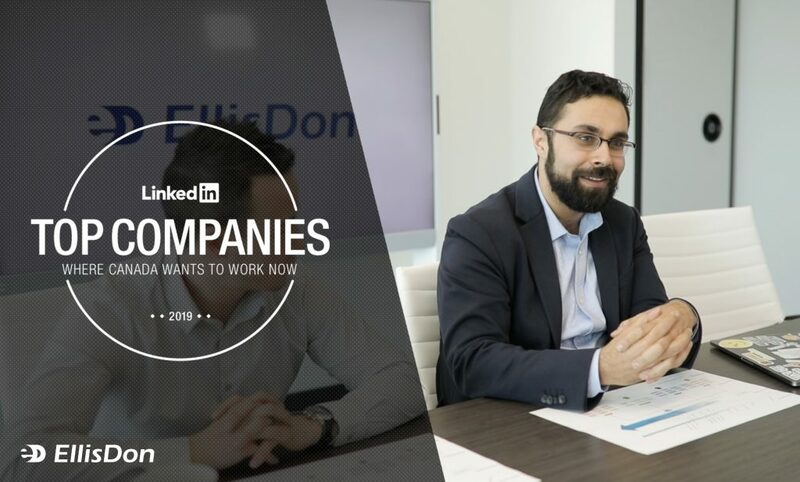 "Being recognized with LinkedIn's Top Companies only furthers our purpose of 'attracting great people with similar values, and enabling each of them to achieve the full extent of their career potential'," said Paul Trudel, Vice-President, People & Culture, EllisDon. The LinkedIn Top Companies list is derived from a blended score looking at factors including interest in the company, engagement with employees, job interest, and retention, and is informed by the billions of actions taken by more than 610 million professionals on LinkedIn. "I am honoured to be a part of EllisDon for its open work culture that emphasizes diversity and fosters an inclusive workplace culture," said Kristine Figuracion, Junior Estimator, EllisDon Calgary. Its collaborative environment challenges me in a way to inspire growth which blooms into a sense of accomplishment that is fulfilling." The Top Companies list is a part of the LinkedIn List franchise, an ongoing editorial series that celebrates professionals and companies making an impact in the professional world.